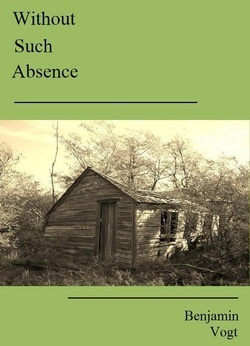 Benjamin Vogt's WITHOUT SUCH ABSENCE is a book filled with unanswerable questions, as if plenitude - of world, or body, or love - can be felt only framed by loss. Vogt loves the natural world and makes us love it, too, especially when he gives formal gardens voice. It's his wit, and terror, and delight that frame these fine poems, finally, that speak the stories behind the old photographs in all our albums. -- Hilda Raz, author of ALL ODD AND SPLENDID and WHAT HAPPENS `No one remembers unless they have a souvenir,' writes Benjamin Vogt. In WITHOUT SUCH ABSENCE, poems themselves become souvenirs. These are photographs of a lost America--wooden schoolhouses, clotheslines, faded flags, and strange gardens--a poetry so polished and formally rigorous that we cannot forget the places Vogt has captured. -- Jehanne Dubrow, author of STATESIDE and FROM THE FEVER-WORLD Benjamin Vogt has a Ph.D. from the University of Nebraska-Lincoln, and an M.F.A. from The Ohio State University. He's received awards from the Dorothy Sargent Rosenberg Memorial Fund and has been nominated for a Pushcart Prize. His poetry and creative nonfiction have appeared in American Life in Poetry, Crab Orchard Review, Diagram, ISLE, Puerto del Sol, Subtropics, and Verse Daily. A poetry chapbook, INDELIBLE MARKS, is available from Pudding House. Benjamin Vogt - Benjamin Vogt has a PhD in English from the University of Nebraska-Lincoln and an MFA from The Ohio State University. His writing and photography have appeared in over 60 publications from journals and magazines to anthologies. Benjamin writes a native plant gardening column at Houzz and speaks nationally on sustainable and wildlife landscapes. He owns Monarch Gardens LLC, a prairie garden design firm. Benjamin and his wife live in Lincoln, Nebraska where they dream of reviving 20-40 acres to prairie, and creating a one acre native plant display garden with artist residency.